Japanese Indigo, also known as Dyer’s Knotweed, is an annual, growing to 75 cm tall. It is a member of the family Polygonaceae and it is related to rhubarb and dock. 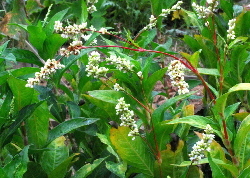 The leaves are soft and dark green, and the plant has swollen jointed stem nodes, which are somewhat hairy. The small white or pink flowers are hermaphrodite (have both male and female organs) and are pollinated by insects. Some greenhouse plants start to flower in late August but others only start to flower in early October. Unlike the pest species Japanese Knotweed, to which it is related, Japanese Indigo is frost tender and needs protection from cold weather. And watch out for caterpillars eating the leaves of greenhouse plants in late September. I have not had any success in over-wintering Japanese indigo as all my plants tend to succumb to greenfly. Fresh seed is needed to grow Japanese Indigo and seed over two years old is unlikely to germinate. Sow your seeds indoors in early May, about two to three weeks before the date of the last frost in your region. Plant the seeds in a tray of compost, but do not cover the seeds with soil. Watering the seeds with the rose of a watering can will cover them up enough. The seeds usually germinate quickly and the plants also grow relatively fast. Be sure to protect your plants from frost though. Japanese Indigo likes a rich soil and plenty of water. When the plants are big enough, I plant them in 5 litre pots and keep them in a greenhouse with the door open. 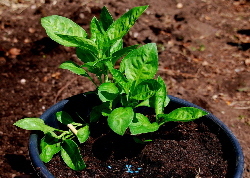 I plant some seedlings outside one week after the last frost and Japanese Indigo should thrive outside in warmer years and in more sheltered positions in the UK. You can increase the number of plants by bending branches and tucking them into the soil. You can harvest the leaves as soon as the plant is large enough and before flowering starts. 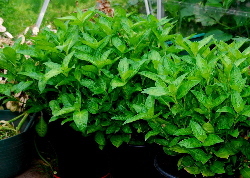 One of my pot plants produced about 250g of leaves, and one of my outdoor plants produced over 1 kg. Rinse the leaves in cold water and drain them. 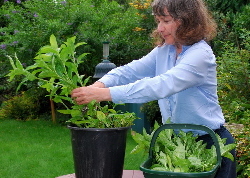 Feed and water the plant well after each cutting and it should then produce another harvest in about four to five weeks. Details of Japanese indigo extraction.